B. Thomas (Arlington, Texas, United States) on 24 April 2018 in Abstract & Conceptual and Portfolio. 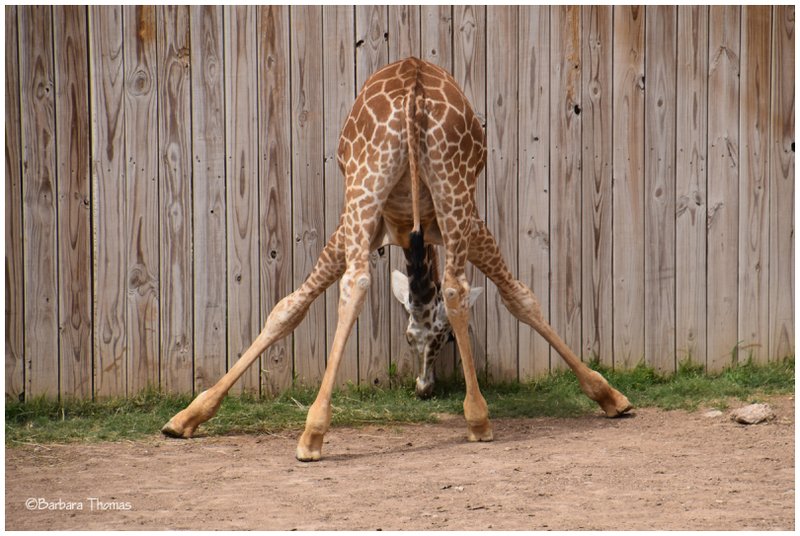 a young giraffe practices her morning yoga. Is this "down giraffe" instead of "down dog?" *Not silly - my hard drive may be fried. I'm limping along on very old laptop and my phone. Already posted a few days ahead and can read but limited comments. That is a great capture..Nice silly pose.and you have caught it perfectly ! In our hoes our grandmothers used to comment that if the two year old elder child strikes a pose like this and looks behind through the space his legs create, the next child will soon be on its way !! Funny title... and intersting attitude. What a wonderful moment ! Great capture of the attitude ! Hope all will be in order soon ! gotta love your title ! this is too cute ! Oh my! What a great capture perfect for Silly Tuesday! I hope your hard drive doesn't die! A well chosen title and photo for this day!! :)) It really seems impossible. I am so sorry to hear about your computer! This is a fabulous ST shot! A lovely shot of the youngster determined to get some of that grass. Elle est beaucoup plus souple que moi !! !